Just about every fantasy draft is in the books and the NFL season kicks off Thursday. It's time to fine tune those rosters and figure out which of your players are the most likely to crush and demoralize your opponent. To that end, I'm here to help you get the running backs in order. This is in large part based on speculation regarding defenses since we're in the first week, but these ranks will steer you in the right direction. I think that the Eagles offense is going to be tough to slow down and it all starts with Murray. The Falcons look like they should have trouble stopping the run and I think this one is a no-brainer. For more on my love fest with Demarco Murray check here. 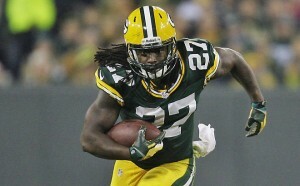 Lacy will put up big points often, starting in week 1. Lacy is a stud and these are not the Monsters of the Midway. With the absence of Jordy Nelson, watch for Green Bay to lean a bit harder on Lacy until they sort out the passing game. The Niners seem like they should be a team in shambles this year. Losing a lot of key players is not a solid recipe for stopping Adrian Peterson. I worry about injury after missing a year, but early on I think that AP should be a solid bet to rack up points! This is a bit of a sketchy matchup on the road versus a stout Texans defense led by the otherworldly J.J. Watt. Charles does too much for me to lower my expectations too much though. If he can't find room to run, look for Smith to toss him some short passes to get him in space. Either way, he's a stud so roll him out there. Here is another road matchup against a strong defense, but Beast Mode isn't scared. Lynch has a solid history of shredding elite defenses, so he should be in the conversation with high level backs. Anderson is the real deal and he plays on what should be a high-powered offense. There isn't much more to say, I just have him a tick lower due to the number of skilled players in Denver. Lots of mouths to feed. Hill is a rare talent and this has the look of a game where some points should be scored. I think that he still loses a few touches to Bernard but this should be Hill's backfield for the most part. This is a similar situation to Eddie Lacy as the Bears have lost a key receiver and may lean on the run game. I think that Forte's skill is waning, but he still has enough left in the tank for some big games. I'm a believer in Justin Forsett (as you can read here), but I don't know how early the Ravens will have to abandon the run. I think that the diminutive back remains involved if Baltimore starts throwing, so he should still have a quality performance. Miller and the Dolphins are facing a Redskins team that has had a dysfunctional offseason and may not be playing as a unit. I think that there is fantasy gold to be had from Miller who is in a contract year, but I also think that they Dolphins will be throwing a lot as their qb is a blossoming star. The Saints have some injury troubles at the moment and that should mean more carries for Ingram. I think that he should even see a few passes in this one as Robinson and Spiller are both questionable. He would be higher, but the Cardinals defense is legit. The other back in this matchup should see his share of touches as well. Of course, it feels like we have been saying forever that Ellington should see a lot of touches but it doesn't happen often. He will get points, but not as many as he should. I'm in no way confident that Shady is going to suit up for this game, but keep an eye on it. Whoever the Bills run out there will see their share of touches with Rex Ryan at the helm. I love the potential that Murray has flashed, but I think that the Raiders coaching staff may fall in love with throwing to Amari Cooper. If Murray can get at least 20 carries, expect good things. Just realize that it is no guarantee. The Jaguars defense is going to be better than people think and Carolina's offense is an unknown right now. I think Stewart sees his share of carries because the receivers are not good, but he'll see stacked boxes. I like Carlos Hyde, a lot. If he were on a better team he would be in my top ten, but he isn't. I'm not sure what kind of run game the Niners will be able to sustain so tread carefully. Ivory is an underrated option as a running back, but Cleveland is going to put the brakes on him in week 1. Gordon's first game is a crapshoot. He has the skills be his role still needs to be defined. Gore will have his moments this season, but the positive ones are not likely to come in week 1 against a stout Bills defense. His best chance at fantasy goodness will be goal line carries after some Andrew Luck passes. Call me crazy, but I like the Jags developing offense. I don't think that they break out big time this year, but they will get close. They are going to run the ball a lot with Yeldon, but the Panthers are too tough to recommend this matchup highly. I like the situation, but I'm not in love with Randle. I believe that the Cowboys want very much for Randle to be "the man", but he may not have the ability. Morris is a steady producer but the 'Skins are in shambles and Miami is a talented defensive unit. Oh, and they added Ndamakong Suh in the offseason. This is a tough matchup for Morris. There is a lot of hype surrounding the muscle hamster going into 2015. I'm not buying it. That is as deep as I'm going to go for week 1. If you're in an incredibly deep league and are looking for rankings beyond the scrub line, let me know. I can certainly expand as the season goes on. Good luck in week 1.